Update: Fox reports that Acosta’s Press Pass has been suspended. 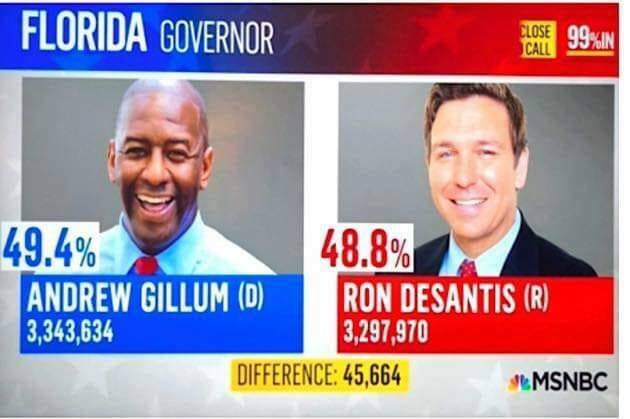 MSNBC released “election results” for Andrew Gillum in Florida a full day BEFORE the election. It was a “test misfire” as they put it. The computer populated the picture with numbers that were nonexistent. (See featured photo). 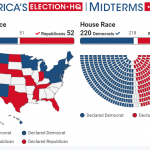 Ron DeSantis actually won the Florida election, even though Gillum had been slightly ahead in the polls. “Quick clarification here. Just want to say, earlier this hour, uh, we showed a graphic of the Florida gubernatorial race. May have caught your eye because our system had inadvertently populated some test numbers. Obviously, we do not yet have any vote totals here, the night before the election. That was a misfire. Don’t worry. I was pretty confused when I saw it up there, to see it there myself.” All In host Chris Hayes to Deadline. CNN had some serious struggles with geography yesterday. 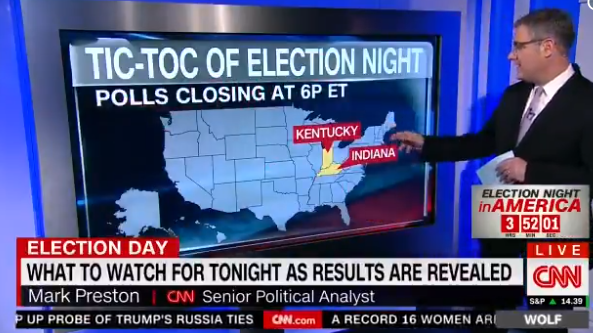 Their “political analyst” appeared to have no clue whatsoever of the location of Kentucky and Indiana. Did this guy pass high school geography? The MSM had their struggles through the election process. Today, during the White House Press Conference, CNN’s Jim Acosta (already considered a bad boy) continued to badger the President with stupid questions. President Trump finally had enough of the constant interruptions. 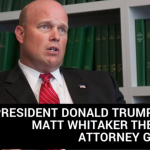 Of course, CNN defended Acosta and bashed Trump, but some other reporters like Chris Wallace and Todd Starnes thought the CNN reporter should have his credentials revoked after “wrestling” with a White House Aide over the microphone.